An ankle sprain is an injury to one or more ligaments in the ankle, usually on the outside of the ankle. Ligaments are bands of tissue— like rubber bands—that connect one bone to another and bind the joints together. In the ankle joint, ligaments provide stability by limiting side-to-side movement. Some ankle sprains are much worse than others. 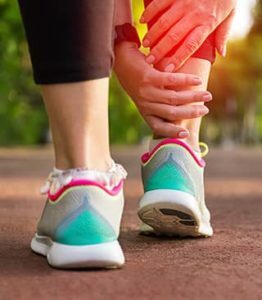 The severity of an ankle sprain depends on whether the ligament is stretched, partially torn or completely torn, as well as on the number of ligaments involved. Ankle sprains are not the same as strains, which affect muscles rather than ligaments. Sprained ankles often result from a fall, a sudden twist or a blow that forces the ankle joint out of its normal position. Ankle sprains commonly occur while participating in sports, wearing inappropriate shoes or walking or running on an uneven surface. Sometimes ankle sprains occur because a person is born with weak ankles. Previous ankle or foot injuries can also weaken the ankle and lead to sprains. ​Ankle fractures are common injuries most often caused by the ankle rolling inward or outward. Many people mistake an ankle fracture for an ankle sprain, but they are quite different and therefore require an accurate and early diagnosis. They sometimes occur simultaneously. An untreated ankle sprain may lead to chronic ankle instability, a condition marked by persistent discomfort and a giving way of the ankle. Weakness in the leg may also develop.